Sam Wear — one of New York’s pre-eminent GIS leaders — published a fun interview with me about our mapping work at the CUNY Graduate Center. I’m honored! Who has time to blog when @Twitter is so much fun? A disaster, natural or otherwise, always creates an opportunity to demonstrate the power of maps. Hurricane Irene did not disappoint. In New York City, which hadn’t seen a hurricane of this magnitude in decades, there were at least a half dozen websites with interactive maps related to the storm (plus at least one PDF map – more on that below) that were used extensively and were tweeted about extensively. My team at the CUNY Graduate Center was in the mix with our OASISnyc.net site, and I was watching with keen interest as more maps kept coming online as Irene kept coming closer. 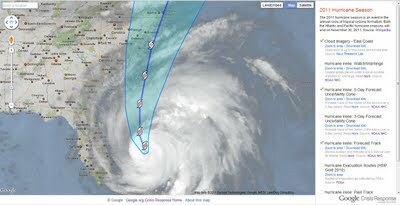 I thought I’d share some observations below about how Irene was mapped in New York. I think I kept good track of the various maps that were deployed, but I’m sure my list and descriptions are incomplete so please chime in if I’ve missed anyone or mischaracterized any of the efforts. Hurricane maps are nothing new, but usually the maps show the path of a hurricane while it’s happening or analyze its impact after the storm has past. This time, for New York City, the more interesting and useful maps were focused primarily on the possibility of evacuation, and the potential impact of the storm on New York’s shores. The interest in these maps was also perhaps more intense than in earlier situations. 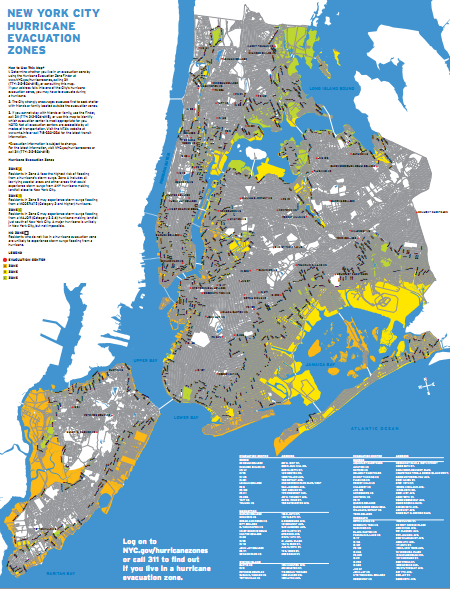 First, New Yorkers almost never evacuate for anything (at least on a scale of hundreds of thousands of residents), so the idea that so many people from only certain areas of the city needed to move to higher ground meant that everyone wanted/needed to know: am I in the evacuation zone? And that meant maps. Second, online interest in this storm in particular was high. Other storms have hit since Twitter and Facebook have been around, but not in the New York area and not at this scale. One writer for GigaOm who had lived through hurricanes on the Gulf Coast wrote that she was “overwhelmed” by the “overall hoopla surrounding Irene online.” For her, it replaced TV as a key source of news (I agree, I barely checked TV news throughout the storm. Twitter and weather-related websites provided all the information I needed, and the news from these sources was more up-to-date.) And because so many New Yorkers were online and hungry for information about evacuations and storm impacts, online maps were critically important. Will I Need to Evacuate? Mayor Bloomberg and other officials started talking about the possibility of evacuation on Wednesday (8/24). 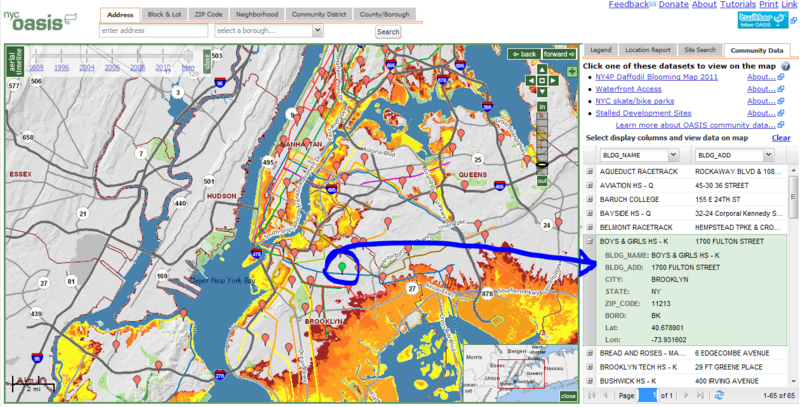 That night, my wife reminded me that our flagship mapping site OASISnyc.net included a layer of “coastal storm impact zones”. Actually, we’ve had that data online since 2007, when it was a Map of the Day on Gothamist. It shows areas at greatest risk of storm surges from a hurricane (and, as it turns out, those areas closely match the boundaries of the city’s evacuation zones – see screenshot below). I had also received a couple of emails that night from other groups wanting to map the evacuation zones and were worried that the city’s mapping resources weren’t up to the task. So I wrote a blog post about how using OASIS could help people see if they were in harm’s way if the storm hit the city. I published the post the next morning (Thursday, 8/25). That same morning, Gothamist posted an item about the potential for evacuation, and they embedded the city’s evacuation zone map. I was the first to add a comment on the Gothamist piece (via our @oasisnycmaps Twitter account), and I included a link to my blog post and to the maps. PDF maps: blessing, curse, or both? Let’s look at the city’s evacuation zone map [PDF – see image at right]. It’s a PDF file. It shows all the city’s streets in black ink, in an 8.5″ x 11″ layout, overlain on color shaded areas (muted green, yellow, and brown) corresponding to the 3 evacuation zones A, B, and C. And it has the evacuation center locations labeled on the map. So it puts a lot of information into one map, which is challenging on its own. But trying to view that as a PDF online can be especially problematic. People who expected something better complained — it was described (perhaps too harshly) as “terrible” and “useless” in the Gothamist comments. People said it was hard to read, took too long to download, it didn’t work well on mobile phones, etc. And quickly after I posted my comment at Gothamist, several people were thankful that they could access OASIS as an alternative to the city’s map. Distributing a PDF map in a situation like this has pros and cons. On the one hand, it has flexibility. The PDF format can be viewed in any web browser, or can be downloaded to your computer and viewed there, and can be printed out to share with someone who doesn’t have Internet access. And lots of people on Twitter were appreciative. On the other hand, it’s not something that can be easily updated, and it’s not what the growing population of digitally savvy New Yorkers would expect or desire. NYC has been touting itself as the most digital city on the planet, and all they could do was put out a PDF? People were underwhelmed. To be fair, the city also had an online “Hurricane Evacuation Zone Finder.” You’d type in an address and it would display a zoomed in zone map of your location. But that provided little context, and it wasn’t as user-friendly as the public was expecting. For a long time this type of web service would’ve been considered state of the art. But these days, I think a lot of people were wondering if New York couldn’t do any better. Luckily the city had posted a dataset in GIS format representing the city’s evacuation zone boundaries. It was available on Datamine, and anyone could download it for free and use it without restriction. So when people asked me if I had the evacuation zones in a format that could be mapped, I just pointed them to Datamine. By Thursday afternoon, online interest in NYC’s impending evacuation announcement was so intense that not only did the city’s zone finder application go down, but even the city’s website — in particular, its homepage — was inaccessible. Although the city will certainly congratulate itself for using social media to get the word out (and I agree they did a good job in this area), it’s not good that the city that strives to be the nation’s premier digital city could not even serve up its homepage at the exact moment when everyone was relying on that web page for information on what was happening next. And with a situation as complex as an approaching hurricane, 140 character tweets are just not enough. I can’t imagine it’s easy to withstand several million hits in a day, but I and a lot of others expected better. The city was left apologizing for no web access and pointing people to its PDF map (at this point hosted on Tumblr and elsewhere). Mayor Bloomberg posted the PDF on his website, but that’s the least he could do. Simply taking a PDF and putting it on another website? Doesn’t take much to pull that off. In the meantime, more maps appeared. WNYC was next. John Keefe, the public radio station’s Senior Executive News Producer, mashed up the city’s evacuation zone data with Google Maps, and put a simple, easy to use interface together. The map didn’t include evacuation centers at first, but it was clean, effective, and … in the absence of the city’s online resources … it worked. John has developed a successful system creating news-oriented maps in short order, and his hurricane map was the latest example. And it was embeddable, so sites such as Gothamist that originally embedded the city’s PDF map, quickly replaced the PDF with WNYC’s interactive map. People were happy. By Friday morning, the city was still having difficulty providing online access to its web page and its hurricane evacuation zone finder app, so more mapping sites stepped up. ESRI published an interactive map of the evacuation zones and evacuation centers using their relatively new ArcGIS.com online platform. 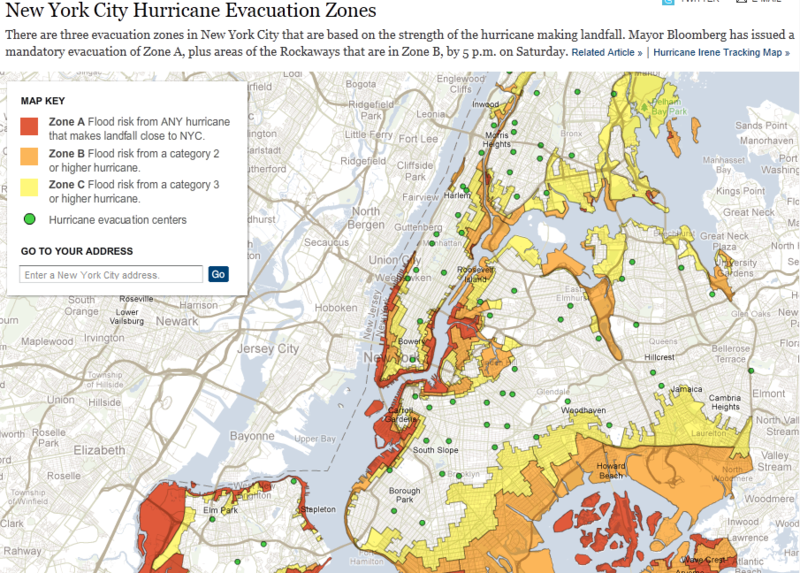 The map looked great, and included the evacuation centers that WNYC’s map was missing. One nice thing about the WNYC site is that is uses Google’s Fusion Tables service on the backend, which makes it easy to set up geographic data and then overlay that data on a Google map or any other modern, online mapping site. At the CUNY Graduate Center we’ve started to use Fusion Tables to integrate community-oriented mapped information into the OASISnyc site. By Friday morning we were able to use Fusion Tables to display the city’s evacuation centers on OASIS’s maps. The OASIS site provides a wealth of information such as subway and bus routes, schools, public housing sites, etc. so it provided a way (hopefully an easy way) to locate evacuation sites in relation to these other locations. By Friday, Google had also stepped in with a mapping service of its own, a customized version of its crisis mapping application. Originally Google’s map omitted the city’s evacuation zones or centers, but it did include several other layers of data related to potential storm impacts (like the storm surge map at OASIS). The federal weather and environmental agencies such as NOAA and FEMA have consistently done a great job of providing free, online access to observation and modeling data about storms, and Google put this information to use. On Friday our team at the CUNY Graduate Center also made two enhancements to our mapping applications to make it easy for a wide range of people to find out if they might be hardest hit by Irene. First, we reconfigured the OASIS maps so the storm surge layer could load quick. We created a pre-cached tiled layer instead of a dynamic layer and also set up the map page so that most of the dynamic layers were turned off by default. This made the map page load quicker, and made the storm surge layer load instantaneously (our site had bogged down a bit on Thursday due to increased traffic — site usage almost tripled to 9,000 pageviews almost solely from my comment at Gothamist with a link to OASISnyc.net — so quick loading was key). We also incorporated the storm surge layer to an interactive mapping site we maintain with the Long Island Index focused on Nassau and Suffolk counties. It seemed that the storm might have a greater impact on Long Island. The storm surge data we used for OASIS was statewide in scope (it was created by NY SEMO), so we coordinated with our partners at the Index and updated the site Friday afternoon. Newsday included a link to the LI Index mapping site, and usage soared over the weekend. Understandably, an organization such as WNYC would limit its map to the city’s 5 boroughs. But there weren’t similar maps for any other part of the tri-state region. Even though mandatory evacuations had been called for much of Long Island’s south shore, the best data available on those areas were lists (some in PDF format) of affected addresses and affected streets. Given the surge in usage of the LI Index mapping site, I like to think that we helped meet a key need. During the day on Friday, Mayor Bloomberg announced the city’s mandatory evacuation plans. The scramble was on to see if you were in Zone A! Not to be outdone by WNYC, Google, or anyone else, the New York Times launched its version of an interactive evacuation zone map late in the day Friday. Like WNYC’s version, the NY Times map was focused and easy to use. But it was also limited to NYC, despite the Times’s readership outside the 5 boroughs who had also been required to evacuate. By then, WNYC and Google had also added the locations of evacuation centers to its maps. So what to make of all these maps? I think the first thing is that they were all generally helpful. When the nation’s premier digital city was incapable of providing digital information in a timely, useful way, others stepped in and succeeded. These efforts, however, suffered to some extent from inconsistencies and lack of coordination. For example, different mapping sites displayed different kinds of information in ways that may have been confusing to the person on the street. Google and OASIS posted storm surge zones and the city (and WNYC, ESRI, and the Times – and eventually Google too) posted evacuation zones. Ultimately what most people wanted to know was if they lived in evacuation Zone A. The storm surge areas were important in terms of anticipating where the storm would do the most damage, but perhaps a more pressing issue was the evacuation. But this difference in approaches underscores the lack of coordination among the various mapping entities. It was as if everyone just wanted to get *their* map online. We’re as guilty of that as anyone. I know top staff at OEM and I easily could’ve contacted them to coordinate the OASIS layer with their’s. But it was somewhat frantic at the time, and the communication didn’t happen. I’d say WNYC was the most earnest in this regard, since they probably just saw a hole that needed to be filled – the city was talking about evacuation, but the city’s evacuation map was sorely lacking or not online. But once WNYC went online, as far as I know there was little coordination among them, us, ESRI, the NY Times, Google, etc. I think you could reasonably ask — since WNYC’s map worked perfectly well, and provided the information about evacuation zones — why have essentially the same map from ESRI, Google, and the NY Times. Were these groups talking with each other? For the media outlets (WNYC and the Times), was it just a competition thing? I do know that when the city’s GIS community was more cohesive, this probably would’ve been coordinated a bit more, perhaps through GISMO. Not that the lack of cohesion is a bad thing necessarily. And not to fault GISMO or other coordinating groups. But I wonder if better information could’ve been provided to the public in a better way if all of us making the maps were in communication. For example, for at least a day WNYC’s map lacked the evacuation center locations. I added the locations to OASIS using Fusion Tables. Then WNYC added the locations to its map, also using Fusion Tables. We easily could’ve shared the backend data, but WNYC never contacted us to discuss it. I sent a tweet to @jkeefe about it, but didn’t hear back. It was important to keep the evacuation center data up-to-date and consistent because the city changed the locations of 4 centers before Irene hit. Keeping the maps in sync would’ve minimized any confusion for the public. Overall, I think the biggest takeaway is that the Mayor’s office and NYC agencies – especially DoITT (since they’re responsible for coordinating the city’s technology resources) – need to engage better with mapping/data/online communities in a much more open, collaborative way. Despite the city’s talk of apps and open data, there’s still very much a closed approach on the city’s part when it comes to public/private partnerships. True, the city has developed partnerships with local startup tech companies. But the city’s nonprofit and academic communities, along with established private entities, have much to share and have proven they have the technological resources to do as good if not a better job than the city providing essential information online. In terms of mapping Hurricane Irene in NYC, NGOs filled a big void. The city should not only recognize that effort, but cultivate it and help sustain it so that it works more smoothly and effectively next time. I attended the GeoWeb 2009 conference and one of my “takeaways” didn’t have anything to do with geography or the geoweb at all (directly, anyway). Each of them were adding the #geoweb or #geoweb2009 hashtags to their tweets, so I could easily search and see all of the commentary. Mainly they were posting comments about whatever session they happened to be attending. But then they were also commenting on each other’s tweets, retweeting, and posting detailed feedback (like Anthony Beck’s neat MindMaps). It was a multi-way, simultaneous, interactive, Twitter-ized conversation among attendees across different sessions and even in the same session. Cool. Btw, my sense of Twitter vs. FB/FF, given the recent acquisition, is that it’s somewhat apples and oranges. To me (relative newbie), Facebook is “personal social” (updates on all manner of personal idiosyncracies) while Twitter is more apt for “professional social”, based on my experience at GeoWeb and since then following people in my professional space. Anyway, I’m hooked. I’ve added a Twitter handle (SR_spatial — though maybe I’ll drop the underscore, that seems to be the conventional wisdom) and started a blog (this one!). Looking forward to diving into this brave new virtual world (but with quite tangible utility in the real one).